How Important Are Proton Pump Inhibitors for Intensive Care Patients? A recent randomized, blinded study (M Krag et al. NEJM 2018; 379: 2199-2208, editorial 2263-4) describes the use of proton pump inhibitor (PPI) therapy in adults (n=3298) in the ICU at high risk for gastrointestinal bleeding. High risk features included liver disease, coagulopathy, shock, anticoagulant therapy, renal replacement treatment, and mechanical ventilation. Overall outcomes were essentially identical. 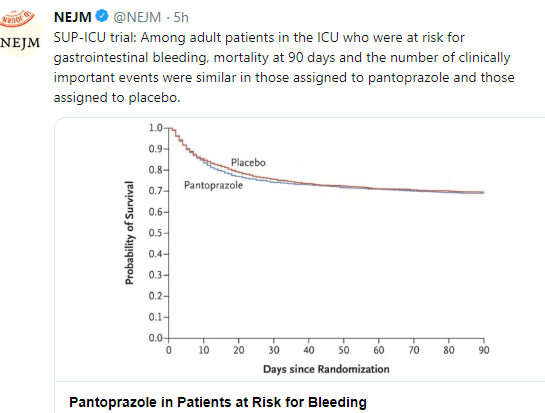 At 90 days, 510 patients (31.1%) in the pantoprazole group and 49 (30.4%) in the placebo group had died (RR 1.02). Using a composite event score to weight potential good and adverse effects (eg C diff infection, myocardial infarction, bleeding, pneumonia) of PPI therapy, the authors found that this occurred in 21.9% of pantoprazole group compared with 22.6% of placebo group (22.6%). Reduction in GI bleeding could be related in part to the more frequent use of enteral feedings. And, the combination of enteral feeding with the use of PPI treatment may increase the risk of pneumonia. This entry was posted in Gastroenterology and tagged proton pump inhibitor therapy, stress ulcer by gutsandgrowth. Bookmark the permalink.